Exactly 100 years after Butch and Sundance met their fate in San Vicente, Daniel Craig’s rogue James Bond arrived in the country with his former MI6 handler Mathis (Giancarlo Giannini), where they are immediately interrupted by the efficient Agent Fields (Gemma Arterton, who recently expressed that she wouldn’t take the role if offered it today). Bond evidently picked up some fresh Tom Ford suits after his visit to Mathis’ Italian villa, sporting the first as his traveling suit as they fly across the Atlantic. 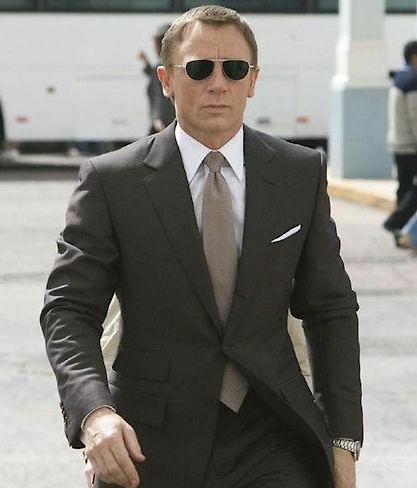 007 looks sharp as he alights in the La Paz airport, wearing his new Tom Ford suit in cool dark brown mohair tonic. Distinctive for its shiny iridescence created by its two-colored warp and weft, mohair tonic enjoyed the greatest popularity during the 1960s mod scene, making it an appropriate suiting for Daniel Craig’s heritage-focused interpretation of James Bond. The details of the suit jacket are consistent with the other Tom Ford “Regency” cut jackets that Craig wears in Quantum of Solace; the front is single-breasted with medium-width notch lapels that roll over the top of the jacket’s three-button front. This 3-roll-2 button stance is perfectly situated with the middle button over the waist, but the lower trouser rise and the long tie create the undesired effect of the tie substantially poking out under the buttoned jacket. Bond’s pick-stitched jacket has a chest chest and suppressed waist with a trim cut that flatters better Craig than the much slimmer fit of his later Tom Ford suits in Skyfall. The natural “pagoda” shoulders with roped sleeveheads emphasize Craig’s concave shoulder lines. He wears a white linen pocket square neatly folded in the jacket’s curved “barchetta” breast pocket, and the hip pockets are straight and flapped with a ticket pocket on the right side adding an extra dash of British detail. The double back vents rise high, approximately 10″. All of Bond’s Tom Ford suits in Quantum of Solace have functioning 5-button cuffs with the buttonhole closest to the wrist cut longer and always left undone, a rakish way for Bond to signal his bespoke tailoring to those who would notice. The flat front trousers have a fashionably low rise with side adjusters revived from the era of Sean Connery and early Roger Moore, although Craig’s adjusters are slide-buckle tabs rather than buttoned “Daks top” adjusters. The waistband is extended across the front with a concealed hook closure on a squared tab. The side pockets follow the slightly curved side seams, and the jetted back pockets close with a button. The straight-leg trousers fit closely to Craig and are finished at the bottom with cuffs (turn-ups). Images grabbed of Daniel Craig on set show more details of his trousers and highlight the shiny aspects of the mohair fabric. This film also marked the return of side adjusters on Bond’s trousers, a Connery-era detail that had been replaced by belts during Roger Moore’s tenure. 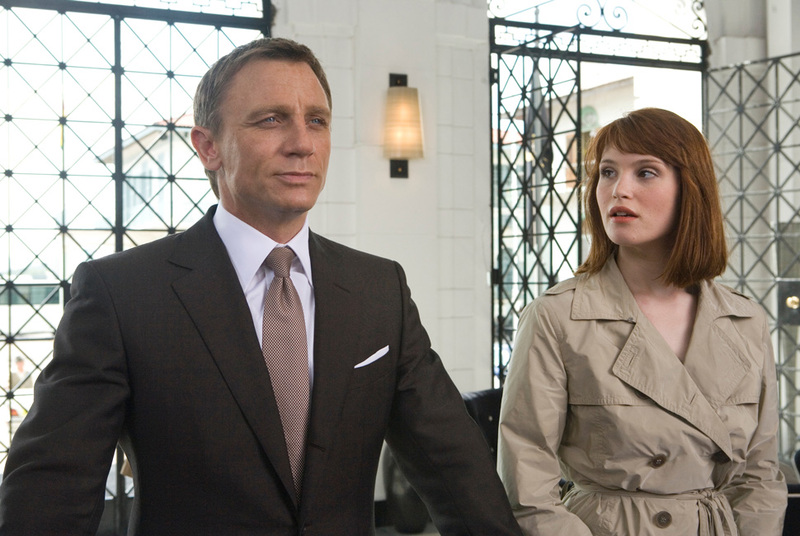 Other than his first appearance in the pinstripe suit (meant to evoke the three-piece suit from the Casino Royale finale), Bond wears exclusively white poplin dress shirts throughout Quantum of Solace, all from Tom Ford, and styled with a large semi-spread collar, front placket, and two back darts. The double (French) cuffs in this scene are worn with gold cluster cuff links that nicely mirror the earth-toned iridescence of both his suit and tie. Also from Tom Ford, Bond’s silk tie is a micro-grid of dark brown and light tan squares that look solidly taupe from a distance and is tied in a Windsor knot… ostensibly with apologies to Ian Fleming. Bond knocks back his sixth in-flight martini. Bargain Bonds may find solace of their own with this “houndstooth” silk tie from Vincenzo Boretti that offers a similar effect for only $17. Brown shoes are traditionally a safe bet when sporting a brown suit, but Bond eschews this comfortable choice in favor of the same black calf full leather Church’s Philip oxfords that he wears with all of his suits in Quantum of Solace. These six-eyelet oxfords have a perforated cap-toe, comfortable suede lining, and oak bark soles. You can find more information about the Church’s Philip at James Bond Lifestyle. (Left) Daniel Craig on set. (Center) Church’s Philip oxfords, as worn by Daniel Craig in Quantum of Solace. (Right) Bond and Fields are escorted to their room. The sun hits Bond’s face as he emerges from the La Paz airport, but he’s thoughtfully prepared for the situation with a pair of matte rhodium-framed Tom Ford FT108 aviator sunglasses, the same shades he rocked with a dressed-down cardigan and desert boots at Mathis’ villa in the previous scene. More information about these Italian-made sunglasses can be found at James Bond Lifestyle or on the Christie’s auction page when Craig’s actual screen-worn sunglasses were sold for £23,750 in 2012. Fields should have rethought her cover story when Bond arrived wearing Tom Ford sunglasses and an Omega watch…not to mention the suit itself. Bond’s wristwatch is the same Omega Seamaster Planet Ocean 600m Co-Axial Chronometer 2201.50.00 that he wears throughout Quantum of Solace with a stainless steel 42mm case and deployment-clasp link bracelet. The round dial is black with a 3:00 date window and luminous hour markers and hands. The specific number of Bond’s watch, which was auctioned by Christie’s in 2012 for £34,850, is #81087613. Given that he spends most of his time in Quantum of Solace gone rogue, it makes sense that he would wear this watch exclusively without Q Branch outfitting him with alternatives. For a great analysis and breakdown of Craig’s suit in this scene, visit Matt Spaiser’s blog The Suits of James Bond. James Bond revives a bold vintage fad with his mohair tonic suit in muted brown, setting the gold standard for travel attire and easing his own path for post-flight stationary-and-Bollinger seductions. Mohair tonic is a very difficult suiting to track down these days. 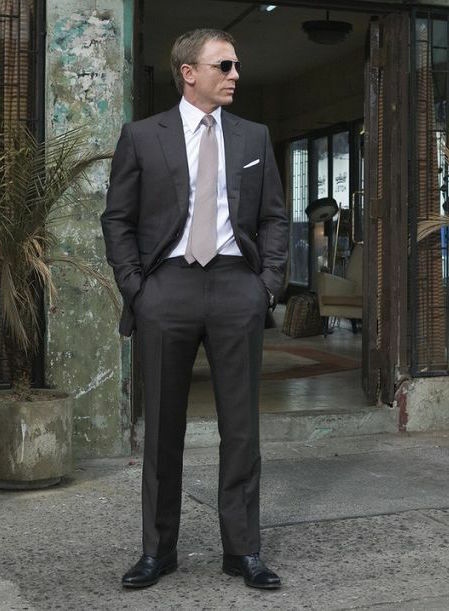 This three-ply “Tonic Ginger” suit from Jump the Gun incorporates the color and basic style of Bond’s Bolivia suit in Quantum of Solace with mod-influenced details like covered buttons and a high-buttoning short jacket. I gave Bond a houndstooth patterned tie in one of my fan fictions, so I suppose this film must have worked on me on a subconscious level. Although, I’m glad to say that I had a 2201.50.00 Planet Ocean two years before Bond. Finally! 007 copied me, for a change. I can’t help but think that maybe Daniel Craig might have asked for a smaller watch than the 45.5mm model that he wore in “Casino Royale”. By 2008, the large watch mania was well and truly in full swing, and the larger model Planet Oceans were outselling the 42mm model worn by Bond in this film. But I did everything I could to inform customers back then that Bond was wearing the smaller-sized model in “QoS”.